For years, every birthday in our house has included the infamous Magnolia Bakery cupcakes. People line up around the block waiting to get into the itty bitty store in the west village to buy a box of these treasured cupcakes. Truth be told, I’m not the biggest fan of the traditional vanilla or chocolate. They are a little grainy and dry and the frosting makes my teeth hurt just thinking about it. Some of the other flavors like spice or red velvet are okay, but they aren’t the real star of the show. 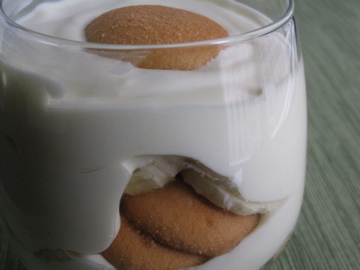 The real star is the banana pudding. It is absolutely ta-die-for, and has long been dubbed by Brad and I as one of the best dessert in nyc. In recent years Magnolia’s have popped up all around town, and I can frequently be found at the one on the UWS. If you are in NYC, be sure to grab a (large) cup, and if not try this recipe at home. It’s really simple and a definite crowd pleaser! Beat in pudding mix for 2 more minutes. Cover with plastic wrap and chill for 4 hours or overnight. Whip the cream with an electric mixer until stiff peaks form. To assemble, do alternating layers of wafers, banana, and pudding. Make as many layers as you like and divey up the ingredients accordingly (you could also make individual portions in stemless wine glasses like I did). Posted in Recipes, Sweets and tagged banana, magnolia bakery, pudding. Bookmark the permalink. I found this post by looking through the “recipes” topic on wordpress – I love it!